Colorado Cannabis Corruption, as predicted! Some of you know I have had a recent change in circumstances again and have been working on getting all kinds of assistance back. On March 22, 2013 I officially applied (filed with the state) for the following assistance programs in the state of Colorado Food Assistance, Colorado Supplement to SSI, Aid to the Needy and Disabled (State AND), Medicare Savings program, Adult Medical Assistance (AM) and the Low income Subsidy (LIS) to aid in prescription drug co-pays. I have also been working on getting some changes made with my Social Security Disability, getting section 8 housing, and filing for a long awaited divorce now that the other party is willing. My social security Disability of $362/per month or $11.90 per day. This my sole source of income other than art print sales. I have also been seeing a doctor frequently about my pancreatic function which has been bad off and on for nearly a year. My Familial Mediterranean Fever (FMF) has made me loose a ton of weight and strength. It was previously misdiagnosed as Fibromyalgia. I’ve been working hard with a doctor to try and improve my health… I am grateful that all of these services are here, but I find I must keep my mouth shut regarding medicinal cannabis while trying to get any of these services except for in my family doctor’s office. I also find that jumping through all the hoops required to get these forms of assistance is really difficult for a weakened body. Let’s go back a couple of years… It’s February 2010. Amendment 20 is the only law and regulations regarding Medicinal Cannabis in Colorado and HB 10-1284 and SB 10-109 are just bills being debated down on Colorado’s capitol hill. Section 14. Medical use of marijuana for persons suffering from debilitating medical conditions. (1) As used in this section, these terms are defined as follows. (a) “Debilitating medical condition” means: (I) Cancer, glaucoma, positive status for human immunodeficiency virus, or acquired immune deficiency syndrome, or treatment for such conditions; (II) A chronic or debilitating disease or medical condition, or treatment for such conditions, which produces, for a specific patient, one or more of the following, and for which, in the professional opinion of the patient’s physician, such condition or conditions reasonably may be alleviated by the medical use of marijuana: cachexia; severe pain; severe nausea; seizures, including those that are characteristic of epilepsy; or persistent muscle spasms, including those that are characteristic of multiple sclerosis; or (III) Any other medical condition, or treatment for such condition, approved by the state health agency, pursuant to its rule making authority or its approval of any petition submitted by a patient or physician as provided in this section. (b) “Medical use” means the acquisition, possession, production, use, or transportation of marijuana or paraphernalia related to the administration of such marijuana to address the symptoms or effects of a patient’s debilitating medical condition, which may be authorized only after a diagnosis of the patient’s debilitating medical condition by a physician or physicians, as provided by this section. (c) “Parent” means a custodial mother or father of a patient under the age of eighteen years, any person having custody of a patient under the age of eighteen years, or any person serving as a legal guardian for a patient under the age of eighteen years. (d) “Patient” means a person who has a debilitating medical condition. (e) “Physician” means a doctor of medicine who maintains, in good standing, a license to practice medicine issued by the state of Colorado. (f) “Primary care-giver” means a person, other than the patient and the patient’s physician, who is eighteen years of age or older and has significant responsibility for managing the well-being of a patient who has a debilitating medical condition. (g) “Registry identification card” means that document, issued by the state health agency, which identifies a patient authorized to engage in the medical use of marijuana and such patient’s primary care-giver, if any has been designated. (h) “State health agency” means that public health related entity of state government designated by the governor to establish and maintain a confidential registry of patients authorized to engage in the medical use of marijuana and enact rules to administer this program. (i) “Usable form of marijuana” means the seeds, leaves, buds, and flowers of the plant (genus) cannabis, and any mixture or preparation thereof, which are appropriate for medical use as provided in this section, but excludes the plant’s stalks, stems, and roots. (j) “Written documentation” means a statement signed by a patient’s physician or copies of the patient’s pertinent medical records. (III) The patient and his or her primary care-giver were collectively in possession of amounts of marijuana only as permitted under this section. This affirmative defense shall not exclude the assertion of any other defense where a patient or primary care-giver is charged with a violation of state law related to the patient’s medical use of marijuana. (b) Effective June 1, 1999, it shall be an exception from the state’s criminal laws for any patient or primary care-giver in lawful possession of a registry identification card to engage or assist in the medical use of marijuana, except as otherwise provided in subsections (5) and (8) of this section. (II) Provide a patient with written documentation, based upon the physician’s contemporaneous assessment of the patient’s medical history and current medical condition and a bona fide physician-patient relationship, stating that the patient has a debilitating medical condition and might benefit from the medical use of marijuana. No physician shall be denied any rights or privileges for the acts authorized by this subsection. (d) Notwithstanding the foregoing provisions, no person, including a patient or primary care-giver, shall be entitled to the protection of this section for his or her acquisition, possession, manufacture, production, use, sale, distribution, dispensing, or transportation of marijuana for any use other than medical use. (e) Any property interest that is possessed, owned, or used in connection with the medical use of marijuana or acts incidental to such use, shall not be harmed, neglected, injured, or destroyed while in the possession of state or local law enforcement officials where such property has been seized in connection with the claimed medical use of marijuana. Any such property interest shall not be forfeited under any provision of state law providing for the forfeiture of property other than as a sentence imposed after conviction of a criminal offense or entry of a plea of guilty to such offense. Marijuana and paraphernalia seized by state or local law enforcement officials from a patient or primary care-giver in connection with the claimed medical use of marijuana shall be returned immediately upon the determination of the district attorney or his or her designee that the patient or primary care-giver is entitled to the protection contained in this section as may be evidenced, for example, by a decision not to prosecute, the dismissal of charges, or acquittal. (3) The state health agency shall create and maintain a confidential registry of patients who have applied for and are entitled to receive a registry identification card according to the criteria set forth in this subsection, effective June 1, 1999. (a) No person shall be permitted to gain access to any information about patients in the state health agency’s confidential registry, or any information otherwise maintained by the state health agency about physicians and primary care-givers, except for authorized employees of the state health agency in the course of their official duties and authorized employees of state or local law enforcement agencies which have stopped or arrested a person who claims to be engaged in the medical use of marijuana and in possession of a registry identification card or its functional equivalent, pursuant to paragraph (e) of this subsection (3). Authorized employees of state or local law enforcement agencies shall be granted access to the information contained within the state health agency’s confidential registry only for the purpose of verifying that an individual who has presented a registry identification card to a state or local law enforcement official is lawfully in possession of such card. (e) A patient whose application has been denied by the state health agency may not reapply during the six months following the date of the denial and may not use an application for a registry identification card as provided in paragraph (3)(d) of this section. The denial of a registry identification card shall be considered a final agency action. Only the patient whose application has been denied shall have standing to contest the agency action. (f) When there has been a change in the name, address, physician, or primary care-giver of patient who has qualified for a registry identification card, that patient must notify the state health agency of any such change within ten days. A patient who has not designated a primary care-giver at the time of application to the state health agency may do so in writing at any time during the effective period of the registry identification card, and the primary care-giver may act in this capacity after such designation. To maintain an effective registry identification card, a patient must annually resubmit, at least thirty days prior to the expiration date stated on the registry identification card, updated written documentation to the state health agency, as well as the name and address of the patient’s primary care-giver, if any is designated at such time. (7) Not later than March 1, 1999, the governor shall designate, by executive order, the state health agency as defined in paragraph (1)(g) of this section. (9) Not later than June 1, 1999, the state health agency shall develop and make available to residents of Colorado an application form for persons seeking to be listed on the confidential registry of patients. By such date, the state health agency shall also enact rules of administration, including but not limited to rules governing the establishment and confidentiality of the registry, the verification of medical information, the issuance and form of registry identification cards, communications with law enforcement officials about registry identification cards that have been suspended where a patient is no longer diagnosed as having a debilitating medical condition, and the manner in which the agency may consider adding debilitating medical conditions to the list provided in this section. Beginning June 1, 1999, the state health agency shall accept physician or patient initiated petitions to add debilitating medical conditions to the list provided in this section and, after such hearing as the state health agency deems appropriate, shall approve or deny such petitions within one hundred eighty days of submission. The decision to approve or deny a petition shall be considered a final agency action. (a) No governmental, private, or any other health insurance provider shall be required to be liable for any claim for reimbursement for the medical use of marijuana. (11) Unless otherwise provided by this section, all provisions of this section shall become effective upon official declaration of the vote hereon by proclamation of the governor, pursuant to article V, section (1)(4), and shall apply to acts or offenses committed on or after that date. Was Amendment 20 perfect as it was written? No, but I was a patient before HB 10-1284 and SB 10-109 were handed down, and there was a lot less greed in the movement then. Did HB 10-1284 and SB 10-109 do what the lawmakers promised the medicinal patients? Absolutely not. We were told that our medication would be safer and that crooks and profiteers would be kept out. Instead the regulations have made it difficult for anyone with a heart to remain in the business let alone giving out compassion. The greed mongering of the movement still sickens me. No one for whom a doctor has signed 18 plants to should go un-Medicated even when in situations when they cant grow for themselves OR pay… if a grower sold the yield of but 6 of my plants and “GAVE” me the rest of “MY PLANTS” back to me, They would still make a profit… And the Colorado Medical Marijuana Enforcement Division? Your corruption literally makes me sick… From a fleet of gas guzzling suv’s you later decided you didn’t need… to all the shortcomings listed in today’s Denver post article by eric gorski... to state officials belly aching that there is not enough money to over see the new recreational program of Amendment 64… Why would lawmakers expect me to trust them on regulating amendment 64 without corruption? In 2010, Your humble correspondent Breezy Kiefair wrote an essay that I first titled “My Personal Christmas Present to the American Taxpayer” and then was published as “Who we are, How we came to be, and why we give back” In Cannabis Health News Magazine’s February/March 2010 print edition on pages 37-29. Cannabis Health News Magazine is edited by long time Colorado Activist Jason Lauve, who in 2010 was Acquitted of drug charges in Louisville, colorado and then started Cannabis Health News Magazine below the video of Jason himself speaking a few years ago follows the essay that appeared in his magazine. A lot has changed since then! Let’s take a look…. Since the passage of HB 12-1099 in June 2012, Hemp Cleans researchers have been conducting studies into the effectiveness of phytoremediation. A limited-scale experiment involving the cultivation of hemp in mining-waste contaminated soils has yielded promising results. Hemp was shown exhibit rapid growth rates in highly contaminated soil. Analysis of the plant material by X-Ray fluorescence has shown that hemp is effective at removing copper (considered by the EPA to be a toxic metal) from contaminated soil. A literature survey has produced evidence that hemp is also effective at removing contaminants such as arsenic, benzo[a]pyrene, cadmium, chrysene, lead, nickel, and zinc. Hempcleans is currently supporting research into development of cultivars which will be ideally suited to Colorado’s climate. The seed stock developed as a result of this research will be used for the purposes of expanding the phytoremediation pilot project to include evaluations of cultivation in fire-scorched alpine soils and saline agricultural environments. And now for some not so good news…..
State regulators charged with watching over Colorado’s medical marijuana industry have fallen short on everything from tracking inventory and managing their budget to keeping potential bad actors out of the business,a state audit released Tuesday found. The findings are a blow to the state Medical Marijuana Enforcement Division as it prepares to take on the additional task of regulating recreational marijuana legalized by Amendment 64. The division, part of the Department of Revenue, has agreed to several steps to improve oversight of Colorado’s 1,440 dispensaries, grow centers and marijuana infused-product businesses. The enforcement divisionhas been beleaguered by budget problemssince revenue from business applications did not come in as anticipated, but the audit found problems that run deeper than that. Auditors say the division has not adequately identified its proper role or done a sufficient job managing its programs and finances. Under Colorado law, medical marijuana business owners must clear many hurdles, including undergoing background checks to root out felons, opening their financial books, installing expensive surveillance cameras and accounting for their product. The state isn’t holding up its part of the bargain, auditors found. For instance, a Florida company was paid $1.1 million to develop a seed-to-sale inventory tracking system, but the division was unable to come up with another $400,000 to put it in place. Auditors also noted that the division doesn’t review a dozen separate tracking forms it requires businesses to submit, including travel manifests showing when medical marijuana plants or products are transported. “It seems to me we have a dysfunctional system of tracking the marijuana,” said state Sen. Steve King, R- Grand Junction. Auditors suggested such a “micro-level” approach to tracking pot may not be necessary now that any adult can grow and possess it under Amendment 64. But Ron Kammerzell, the division’s acting senior enforcement director, said the division is working to put the tracking system in place by year’s end at little or no additional cost. He called inventory tracking “critical” to preventing medical marijuana from being diverted out of the system, including out of state. Meanwhile, more than 40 percent of businesses who met a deadline to file license applications in the summer of 2010 have yet to be fully processed. Those businesses were grandfathered in — allowed to stay open even though the division has yet to license them. And auditors questioned why some licenses were approved. In 13 of 35 new business applications reviewed by auditors, evidence was found “of potentially disqualifying information.” Auditors flagged five files for concerns about past felony arrests, possible financial assistance coming from a “potentially unsuitable person” from out of state, and involvement in drug- or alcohol-treatment classes. Ten applications in that pool received licensing, and auditors questioned whether four of them deserved it. Auditors also found evidence of businesses located within 1,000 feet of schools, which is barred by state law. A program to license employees at medical marijuana businesses is flawed, as well, auditors found. Although applicants must be of “good moral character,” a review of 25 randomly chosen applications found a license was issued for 22 before the division had received the results of a fingerprint-based criminal-history check. Seven of the applications included documentation of past arrests, including one case in which the person had been arrested for felony aggravated robbery and felony menacing with a deadly weapon. The auditor’s office suggested dropping the occupational licensing requirement and, instead, require businesses to subject their employees to criminal background checks. Division director Laura Harris, however, saidlaw enforcementstrongly supports the licensing. • Seizures of marijuana from businesses that are not fully explained and “weak controls” over its destruction, including insufficient documentation and a storage facility that features weaker security features than those required of medical marijuana businesses. • Questionable spending, including purchases for furniture, BlackBerry phones and a fleet of vehicles. The division racked up 19 straight months of net losses, including a loss of about $2.3 million in June 2011 because of large capital purchases. • A failure to identify all medical marijuana businesses in the sales tax system, underreporting sales tax revenue generated by 56 dispensaries by about $760,000 in fiscal years 2011 and 2012. The division agreed to a number of recommendations, including steps to improve the application process, monitoring, expense controls, and seizure and destruction policies. The enforcement division says it had to stretch one year of operating expenses over two because of a moratorium on new business applications, a key source of its funding. Last year, it closed three satellite offices and trimmed its staff from 37 to 15. The legislative committee will meet again Wednesday to complete its review of the audit. DENVER (CBS4) – The best-laid plans of Colorado’s Medical Marijuana Enforcement Division have backfired, leading to what one lawmaker is calling gross government excess. 4 On Your Side Investigator Brian Maass found the state agency ended up with more vehicles than workers. There were some things they didn’t take into account in their planning, so now their flub will end up costing the public. The Medical Marijuana Enforcement Division was banking on collecting huge fees from dispensaries. Now they’re collecting criticism. CBS4 found that last year the medical marijuana enforcement staff signed an eight-year lease for two dozen brand new vehicles , mostly 4×4 monster black SUVs that cost $30,000 apiece. Requisition forms say the SUVs were critical so enforcement agents could go off road. The lease for the tricked-out SUVs costs nearly $750,000. But in a matter of months after signing the lease, the agency found fees were not rolling in and it wasn’t going to grow, but was going to have to cut staff from 37 down to just 12 employees. “They expected that the licensing money would come in faster than it did, so the expectations were not fulfilled,” department spokesperson Mark Couch said. Couch said they signed on the dotted line for a fleet of SUVS assuming they would be used. “We ended up with more vehicles than we needed,” Couch said. Stacked up with more SUVs than staff, the Medical Marijuana Enforcement Division has now farmed out 15 of the monster SUVs to other state agencies that may not really need them, but have them anyway. A couple went to Auto Industry Enforcement, two others to gaming, one to the agency that oversees horse and greyhound racing, five others to the Department of Personnel, five to the Colorado State Patrol — agencies that may not need full-size, 17 mile a gallon kitted out SUVs, and could have done with more economical, fuel-efficient cars . “I want to see systems that take the least expensive route possible, and what I see here is I believe the opposite,” state Sen. Kevin Lundberg said. Lundberg calls what CBS4 found government excess and a waste of public money. “It looks like a bureaucracy that had too many dollars to spend, and guess what they did? They spent it,” Lundberg said. Lundberg believes CBS4′s investigation shows more controls are needed on government spending because he says without such controls government grows out of proportion and he says that’s what happened in this case. 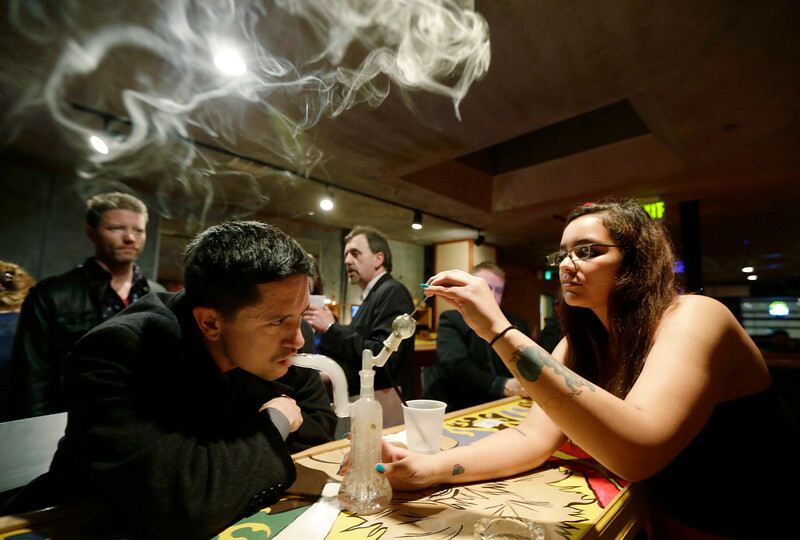 Jeff Call, owner of the Stonegate pizza-and-rum bar in Tacoma, Wash. has opened a second-floor private club lounge area of his bar that allows the use of marijuana in the form of non-smoke vapor. Call charges patrons a small fee to become a member of the private second-floor club, which prohibits smoking marijuana, but does permit “vaporizing,” a method that involves heating the marijuana without burning it. Club 64, a marijuana-specific social club in Denver, Colorado, and The Hive Co-Op Cannabis Club in Lafayette, Colorado are also taking advantage of the new marijuana laws. Last fall, Washington and Colorado became the first states to legalize marijuana use for adults over 21. The failings of Colorado’s medical-marijuana systemshow the danger of not spending enough money on regulations for recreational pot, a state attorney told lawmakers Tuesday morning. Deputy Attorney General David Blake, who sat on a task force that proposed rules for recreational marijuana in Colorado, said lawmakers must create a consistent, multimillion-dollar funding stream to adequately police the forthcoming recreational marijuana system. “If (the regulation of) this industry is not fully funded, it will be a huge problem for the state of Colorado,” Blake said. Blake’s comments came at the same time lawmakers in a different meeting were learning the results ofa scathing auditon the state’s underfunded medical-marijuana regulatory system. The audit concluded thatmedical-marijuana regulations have failedin part because of a lack of money. Without enough money for enforcement, regulations intended to keep recreational marijuana away from kids or leaking into the black market will similarly founder, Blake said. Blake was speaking during one of the last meetings of the legislature’s joint marijuana committee, which is takingthe Amendment 64 task force’s suggestionsand working them into a bill. The committee must finish its work by the end of the week. It is scheduled to hold its final meeting Thursday morning, at which it will decide on the most contested issues before it: taxes, industry structure, marijuana potency, cannabis tourism and more. The task force has suggested that lawmakers seek heavy taxes on recreational pot. In addition to a 15 percent excise tax and a standard 2.9 percent state sales tax, the task force urged legislators to ask voters to approve an extra sales tax on marijuana — perhaps as much as 25 percent. Amendment 64, the measure Colorado voters approved legalizing marijuana and allowing it to be sold in special stores, says the the state can charge up to $5,000 in application fees to open a pot shop. But Blake, who sat on the task force, said fees alone are unlikely to be able to pay for the regulations, even if lawmaker also create extra licensing and renewal fees. Jack Finlaw, an attorney for Gov. John Hickenlooper, said lawmakers also can’t depend on the possible excise tax because the amendment earmarks the first $40 million collected annually for school construction. “Even if the excise tax is approved, there will be no money going into the general fund for the foreseeable future,” Finlaw said. That has left officials looking for new money sources. One proposal is for the state to use fee money meant for medical-marijuana regulation to pay for the first months of recreational marijuana policing. That, however, could prompt lawsuits, and some lawmakers on Tuesday were skeptical of the approach. The state must start issuing licenses for recreational marijuana stores by Jan. 1, 2014. Lawmakers, though, only have until May 8 — the last day of the legislative session — to finalize rules for the industry. Can someone be too stoned to drive? A bill that would set a legal limit for the amount of THC allowed in a motorist’s bloodstream has cleared its first hurdle and passed unanimously in the Colorado House Judiciary Committee Tuesday night. Under House Bill 1114, drivers caught with five nanograms THC, the psychoactive ingredient in marijuana that produces the “high” sensation, in their blood would be considered to be driving under the influence of marijuana and could be ticketed similarly to a person who was considered to be too drunk to drive. Read the full text of HB-1114 here. This is not the first time a marijuana DUI bill has emerged in the state legislature, however all previous attempts have failed in years past. But this year, Waller thinks that a standard blood-THC limit is more critical with the passage of Amendment 64, which legalized marijuana for recreational use for adults. As in previous years when marijuana DUI bills have come up for debate, opponents say that the 5 nanogram standard is too low for frequent pot smokers, especially medical marijuana patients, who regularly have this level of THC in the bloodstream and therefore, if passed, these people would lose their driving privileges, The Denver Post reports. But Rep. Waller says that this bill is different than the previous bills because it allows for a person who has been charged with having 5 nanograms of THC in their blood torebut the charge that they are too impaired to drive, according to 7News. “For example, if you did not exhibit poor driving, you can put that on as evidence to say, ‘Look my driving was not poor, I’m not unsafe to operate a motor vehicle,'”Waller said during the hearing. Last year Sen. Pat Steadman (D-Denver) spoke out about the issues that make marijuana blood limits problematic like the fact that THC is fat-soluable, so blood limits could remain above the 5 nanogram limit for days after the user last legally smoked pot, CBS4 reported. The user would not appear stoned, but legally they could still be considered impaired. With this thinking in mind, Steadman tried and failed to exempt medical marijuana patients in the bill. This fact of THC’s different effect on the body than alcohol’s was stunningly shown in 2011 by Westword pot reporter William Breathes. After a night of sleep and not smoking pot for 15 hours, a sober Breathes still tested nearly three times higher than the proposed legal limit. To add confusion to the matter, Washington state television station KIRO recently assembled a group of volunteers, had them smoke pot and set them loose on a driving test course to try and answer the question: How high is too high to drive? The less-than-scientific results, while entertaining, unfortunately don’t add much clarity to the question at hand. A regular smoker of marijuana tested above the legal limit to begin with, yet drove without much of a problem. Two casual smokers also navigated the course without incident. However, after smoking more marijuana, driving ability began to devolve quickly. Washington state voters, along with voters in Colorado, passed recreational marijuana amendments last November, but Washington, unlike Colorado, already passed a marijuana DUI bill in 2012 setting the legal impairment standard at 5 nanograms in the state. And in Washington, the enforcement of the law ultimately comes down to common sense. Explains Bob Calkins, a Washington State Patrol spokesman, to The Oregonian, “We don’t just pull people over and draw blood… If you’re driving OK, we’re not going pull you over. But driving impaired is still driving impaired.” Watch KIRO’s full stoned driving segment here. The bill now advances to the House Appropriations Committee for another vote. Colorado currently has an over 90% conviction rate for people charged with driving under the influence of Cannabis. Senator King and Representative Fields feel there needs to be more, but we disagree based on the full scientific evidence. The science that was used to fuel the argument for this bill is flawed. Dr. Jan Ramaekers, Head of the Department of Neuropsychology and Psychopharmacology at Maastricht University in The Netherlands, conducted the study that is used frequently to argue for the 5 nanogram limit. This study did not use frequent Cannabis users, and therefore can not be used to encompass a population. This study also stated that one hour after Cannabis use “THC generally did not affect task performance” Leaving 5 nanograms a questionable number when in one hour safe driving could be feasible according to the study. The National Institute of Drug Abuse’s (NIDA) study of heavy users showed that even after 24 hours of secured clinical observation where the participants were not allowed to ingest Cannabis, blood levels came back as high as 7 nanograms. This raises alarms because a cannabis high lasts on average, a couple of hours. If 24 hours later, a person still tested over 5 nanograms. That leaves a person legally intoxicated in the eyes of the court, if the Per Se 5 nanograms law is passed. The NIDA study shows more weight when compared to the article by Westword in Denver showing that Staff Cannabis writer William Breathes tested 3 times the legal limit when tested 24 hours after Cannabis use. All of these studies are available via the web to independently review. In conclusion, We already have an effective protocol in place to punish those who currently drive stoned. The introduction of a Per Se 5 nanogram limit leaves too many people at risk for a false conviction of DUI when studies have shown they could be completely sober at over 5 nanograms. By signing this petition, you tell the Legislature to vote no on a seriously flawed bill. A Colorado House committee advanced a bill to set marijuana blood limits for drivers Monday. House Bill 1114, also known in previous years as the marijuana DUI bill, would say that drivers are legally impaired if their blood contains more than 5 nanograms of THC per milliliter. THC is the psychoactive ingredient in marijuana. In February, the state’s 24-member marijuana task force endorsed the bill meant to mirror the drunk driving limit of .08 blood alcohol content except for one significant exception: drivers would be able to argue in court that they are not impaired at the 5 nanogram limit. Three previous attempts to set a marijuana blood limit for drivers, including one just last year, failed in the state Senate and one of the bills’ most contested aspects has been the actual limit itself. Opponents have argued that a person’s size, tolerance and other factors have an effect on whether or not 5 nanograms of THC would cause driving impairment. Frequent users, like medical marijuana card holders, can surpass that limit even if they haven’t been smoking recently. “I haven’t had a car accident since I was 18, and I’ve had marijuana in my system for most of that time,” said marijuana activist Paul Saurini, 39, in a report by The Washington Post. The bill however is cleared for a vote by the full House that could happen as early as this week. Meanwhile in Washington, the other state that voted to legalize marijuana, some have argued that the 5 nanogram limit is still too low for a DUI standard. This week, the Cannabis activism movement also lost two more warriors. A man whose fight with AIDS and Hepatitis C withered his body and made him the public face of medical-marijuana patients in Colorado has died. David “Damien” LaGoy, 53, passed away Saturday, advocates from the group Sensible Colorado announced this week. In 2007 and again in 2009, LaGoy won major court battles that secured medical-marijuana patients a voice in the regulatory process and that laid the foundation for the earliest medical-marijuana dispensaries. In both cases, LaGoy challenged the state Health Department’s adoption of rules that limited the number of patients a caregiver — a small-scale provider of medical marijuana — could serve. The limit was set at five, and LaGoy said that would have left him without a marijuana provider because he was his Pope’s sixth patient. In both court cases, the judge ruled that Health Department officials had failed to consider public input and had adopted the patient limit arbitrarily. In his 2009 ruling on one of LaGoy’s lawsuits, Denver District Court Judge Larry Naves blasted the state for ignoring the concerns of patients, specifically citing LaGoy’s circumstances. “How can you not consider the impact on the health of Mr. LaGoy when they changed the rules?” Navesasked the state’s attorney. “It’s not temporary for Mr. LaGoy,” Naves replied. LaGoy was diagnosed with HIV in 1986 and Hepatitis C in 1998, according to Sensible Colorado. The medical treatments for both conditions left him with severe nausea, which he used marijuana to quell so that he could eat and keep the medicines down. A slight man, LaGoy’s weight fell below 100 pounds at one point. With the help of marijuana, it reboundedto 110 pounds, he told The Post last year. He began marijuana advocacy in 2006, Sensible Colorado said, after he was arrested for marijuana possession in Denver despite the passage of a ballot initiative in the city to decriminalize possession of the substance. His victories in the two medical-marijuana cases, for a time, allowed caregivers to serve an unlimited number of patients. It also provided the legal foundation for the state’s first medical-marijuana dispensaries, which operated, essentially, as large-scale caregivers. After dispensaries became entrenched in the state, lawmakers created new laws that legitimized them but also separated them from the operation of caregivers, upon which lawmakers placed a new five-patient limit in most circumstances. LaGoy shifted his advocacy to condemn efforts by the federal government to shut down dispensaries. The Ganja Granny Arlene Williams of Green Ribbon world had the sad news of breaking to the world the passing of Ken Unger. “Kenneth Unger December 25th, 1958-March 27th, 2013 He fought for our country and he fought for Legalization of Cannabis. Rest in Peace. I am confident wherever he is, It is ALL Legal… Ken Unger passed today at 1:30 central time, services will be Monday April 1 from 4 to 8 pm at Buchholz mortuary 837 Mid Rivers Mall Drive, St Peters MO 63176. In lieu of flowers donations to Disabled American Veterans, American Heart Association or Missouri Norml. Ganja Granny http://www.greenribbonworld.com sez LETS GET IT ON! The time is ripe with possibilities and we all have to keep up the momentum. From 2009 right up until today, I have been writing for this cause. There has been a lot of my own story told along the way. But what is the point of all of this information? Despite a little bit of progress, not much has changed for the positive in Colorado for the low income cannabis patient. Colorado Cannabis Corruption, is running rampant as predicted! Always remember you can tell what a person really believes in by their actions… your actions prove to all the world who and what you bow down to in this life… Your actions tell people what your free will wants far louder and more plainly than your words ever could… When you are gone, those same seemingly small actions will give you exactly what you deserve.. to quote a long forgotten bit of poetry I read once on a faded newspaper clipping in a children’s reader from the 1860′s “how will men remember you when that you are gone… the little things you say and do, they shall linger on.”So I ask each of you to take a good look inside your own heads, hearts, spirits and souls and ask yourself… who do you serve? do you serve only yourself and ignore your fellow man? We all have areas we need improvement…. If you look in there and find your actions are not showing what is in your heart, then maybe it’s time to change your behavior to be more in line with the light shining within you however you choose to understand it….. that being said…. have a blessed day fully in line with your own free will and heart…. This is my medicinal cannabis path. It is my life. I must master knowledge of it, as I must master my life. Without me fighting for it, my medicinal cannabis is useless. Before my creator I swear this creed. So be it … until there is no prohibition.